Paragon 186 Magnifying Lamp (Only) - The 5-Diopter (x2.3) magnifying lamp with round distortion free lens and 22-Watt cool circline fluorescent bulb. 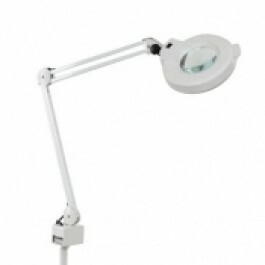 This magnifying lamp helps to eliminate shadows. Comes with a C-clamp table vise that fits with all facial vaporizer combos. Has a 1-Yr limited warranty. To order the metal roller stand #53 for the magnifying stand. Please call Wholesale Salon Equipment at 800-566-2977.